Antipater I the Idumaean (Biblical Edom) (died 43 BC), was the founder of the Herodian Dynasty. 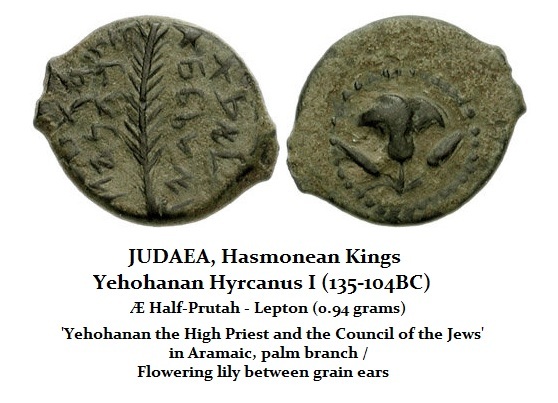 Judah Maccabee’s nephew Hyrcanus I actually forcibly converted the inhabitants of Idumaea to Judaism in the 2nd century BC. Antipater was the real power behind the throne of John Hyrcanus II (Yonatan) (63-40BC). During the course of the Roman Civil War between Julius Caesar and Pompey the Great, which erupted in 49 BC, the political power of the Jewish world was also dramatically altered. His father Antipater had gone to the aid of Julius Caesar when he was surrounded by Ptolemy XIII in Egypt who had opposed his sister Cleopatra VII. As a reward, Antipater became a “friend” of Caesar, which provided the foundation for his heirs and their close relationship with the rulers of Rome. Furthermore, Caesar had bestowed upon Antipater a Roman citizenship which bestowed the privilege of freedom from taxation. Additionally, Antipater’s sons Herod and his brother Phasael were named governors of Galilee and Judea, which further cemented Herod’s later position of power following his father’s death in 43BC. After the assassination of Julius Caesar on the Ides of March in 44 BC, Antipater was compelled to side with Cassius against Marc Antony. When Cassius fled Rome, he went to Syria and demanded to collect troops. Cassius imposed harsh tributes and he sized even entire cities and sold them into slavery. Cassius had then demanded 700 hundred talents out of Judaea. Malichus was in charge of collecting the tribute and he had always disliked Antipater. He deliberately was slow in collecting the tribute from Judaea in hopes that Cassius would overthrow Antipater and give Judaea to him. Antipater had saved Malichus‘ life on more than one occasion. Antipater and Herod joined the side of the Caesareans during the subsequent civil war. Backing Marc Antony and Caesar’s grandnephew Octavian (Augustus) proved to be the correct decision and thereby established the Herodian Dynasty. Nevertheless, Malichus continued to seek to overthrow Antipater. Josephus says he devised multiple assassination attempts which Antipater evaded. However, eventually, he was successful in bribing one of Hyrcanus’ cup-bearers to poison and kill Antipater in 43BC.